Thousands of Americans will leave a mark on the U.S. Postal Service's latest commemorative stamp. In honor of the 50th anniversary of the March on Washington, the agency today unveiled a limited–edition stamp comprising about 3,000 user–submitted profile pictures from Facebook and Twitter. 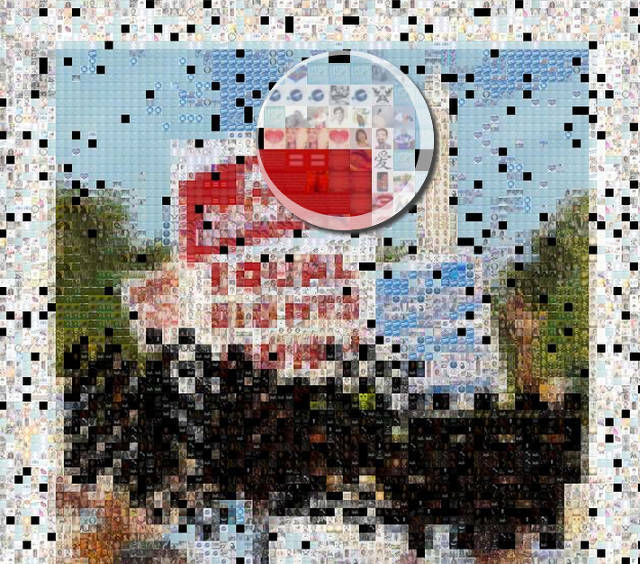 The resulting mosaic is the Postal Service's first stamp to debut on digital platforms. Actress Gabriel Union will tweet an image of the stamp Friday morning at a ceremony taking place at the Newseum in Washington, D.C. The USPS Facebook app lets users zoom in for a more detailed view of individual photos. "We feel this digital unveil marks a special moment to commemorate the civil rights movement," Nagisa Manabe, the USPS's executive vice president and chief marketing and sales officer, told Fast Company. "We have been looking for ways to engage a new generation of stamp collectors and the American public as it relates to our limited–edition stamps." Considered a watershed moment in the civil rights movement, the March on Washington, where Martin Luther King, Jr. delivered his "I Have a Dream" speech, helped spur the passage of the Civil Rights Act of 1964. Along with the March on Washington stamp, the agency is issuing another stamp Friday to honor Althea Gibson, who in 1957 was the first African–American to win the Wimbledon Championships. These follow earlier releases this year paying tribute to the 150th anniversary of the Emancipation Proclamation and Rosa Parks, who would have celebrated her 100th birthday in February. The postal service has struggled to stay relevant in a digital age. And it faces mounting financial difficulties––losses have reached $4 billion this year so far, and the agency posted a $16 billion loss last year. Manabe noted commemorative stamps remain in demand. "The popularity of stamps continues because people love an opportunity to commemorate major American accomplishments," she said. Let's hope they get a lot of likes.